I needed an excuse to use my immersion blender (a birthday present) and to eat the baby carrots in the fridge. 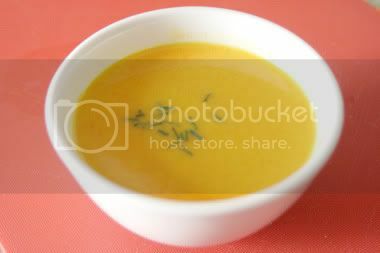 And that's when I found this Carrot & Ginger Soup recipe. There was no messing around with the recipe except for the usual shallots-for-onions switch and I halved the recipe almost straight down the middle. That's what follows. 1. Melt butter in large stock pot over medium heat. Add onion, ginger and garlic; saute until translucent (just before the garlic starts to brown). 2. Add the stock, wine and carrots. Heat to boiling. Reduce heat and simmer uncovered over medium heat until the carrots are very tender, about 30-45 minutes. 3. Puree the soup in a blender or processor (fitted with steel blade). Season with lemon juice, curry powder, salt and pepper to taste. Sprinkle with chives or parsley. Serve hot or cold. Something was lacking in the recipe. I ended up throwing in a few dashes of sriracha and that seemed to resolve it. It was the same old story: there were strawberries in the fridge that had to be used and I wanted to try something completely different. 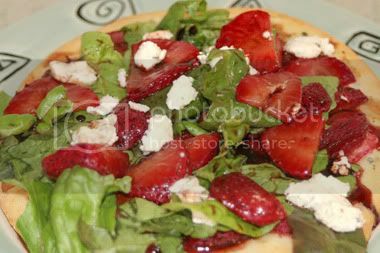 That led me to Savory Strawberry Pizza. Here's some food math for you: a balsamic reduction + strawberries + goat cheese = yum. It's really that simple. I cheated by using a frozen pizza crust instead of making my own (yes, that means I poisoned myself with wheat--I'm still alive), and then just halved the recipe, more or less. I could have cut the lettuce up a bit smaller and crumbled the cheese a bit finer, but I wasn't worried about presentation. I was more concerned about getting it into my mouth as fast as possible. 1. Bake the crust (approximately 10 minutes at 350 degrees, depending on your brand). 2. On warm crust smear a thin coating of goat cheese – about an ounce. 3. Toss strawberries in balsamic reduction and spread on top of cheese. 4. Bake at 400 degrees for another 10 minutes. 5. Remove from oven and top with the rest of the goat cheese. 6. Add greens (I used red leaf lettuce). 7. Drizzle entire pizza with remaining reduction. I didn't even realize there were two reduction recipes on the page, I was in such a hurry to eat. I wonder what the white reduction would taste like. I love balsamic vinegar, so I was happy with what I made, but your mileage may vary. The other day I came across a show called Just Cook This. It's hosted by Sam Zien, a no nonsense kind of guy who seemed to actually be cooking in his own kitchen. Or so he claimed. Regardless, he was making beef chow mein and it looked delicious. Also, it was super simple: just peanut oil, tomatoes, beef strips, frozen chow mein noodles, and black bean garlic sauce. Nothing else. He didn't even season the meat, the sauce was sufficient flavor. So he claimed. You see my theme? As straightforward as Sam appeared, I had to try this at home. Since the available chow mien noodles are usually made with things I have to avoid (eggs and wheat), I opted for saifun noodles. Saifun is thin threads made of mung beans, also called cellophane noodles, mung bean threads, Chinese vermicelli, or any variety of names. They come dried in a package of 3 bunches and are found in the ethnic or international aisle of the supermarket. The first time I tried this recipe, I made it with beef strips. That was fine, but I wanted more veggies. So when I made it with chicken (which I DID season, lightly) I threw in some orange bell peppers and wilted red leaf lettuce. And because this was a test, I was only cooking for one. Which meant just one chicken breast, and a few other changes reflected in the recipe. You might want to use more noodles or vegetables if you're cooking for more than just yourself. 1. 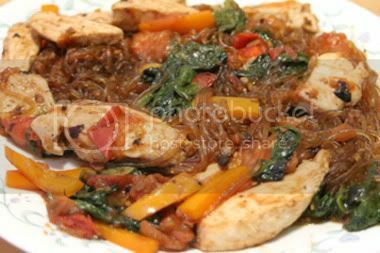 Soak noodles in warm water for about 15 minutes before cooking. This will allow them to soften up. 2. Slice chicken into very thin slices. Season lightly with the Adobo seasoning. 3. Preheat a pan or wok on stovetop and heat really well over high heat, then add oil. When the oil is smoking,add chicken and stir fry for a couple minutes until it is cooked through. Remove and set aside. 4. With the pan back on the heat and smoking again, add a teaspoon of oil and the vegetables. Stir-fry about a minute. 5. Drain the noodles. Add them with the chicken and black bean sauce to the vegetables. Stir until the sauce is thoroughly covering everything and all is heated. It was a solid dish. I had half of it for dinner and the other half for lunch the following day. It's even good cold. My mom and I are both fans of Aarón Sanchez, the resident Mexican chef on The Food Network. And it just so happened that Food Network Magazine was hosting a pre-Cinco de Mayo event in LA the same night as mom's birthday. 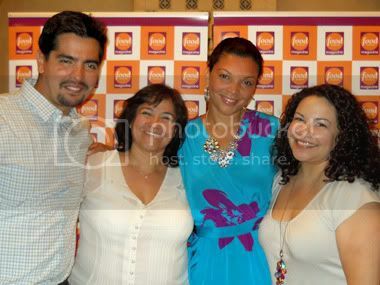 The event was held at The Spanish Kitchen in West Hollywood. The place was not overwhelmingly packed, and everyone was very friendly as we shared tables over nouveau Mexican food. But the crowning moment of the evening was getting to meet Aarón and his wife Ife. The stereotypical chef ego was nowhere to be found here. Aarón and Ife are two of the most down to earth people I've ever met. They were so genuinely nice and gracious throughout the evening, Aarón even went around to all the tables thanking everyone for coming. He then ended up at our table for about 10 minutes chatting about Puerto Rican cooking with my parents and joking with my dad about how in New York, Puerto Rico is considered the sixth borough. It was a great way to celebrate mom's birthday.